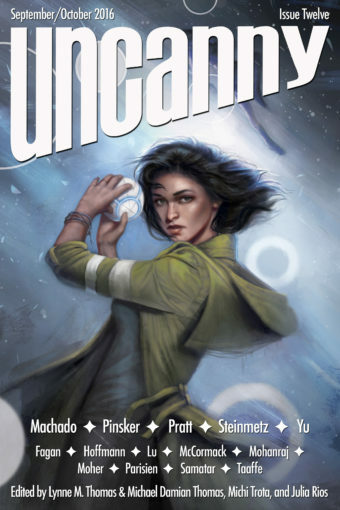 Welcome to Uncanny Magazine Issue Twelve! All of the content will be available for purchase as an eBook (PDF, EPUB, MOBI) on September 6, 2016. The free online content will be released in 2 stages—half on September 6, and half on October 4. Featuring all–new short fiction by Carmen Maria Machado, Tim Pratt, Sarah Pinsker, E. Lily Yu, and Ferrett Steinmetz, reprint fiction by Sofia Samatar, nonfiction by Mary Anne Mohanraj, Una McCormack, Aidan Moher, and Dominik Parsien, poems by S. Qiouyi Lu, Ada Hoffmann, and Sonya Taaffe, interviews with Carmen Maria Machado and Sarah Pinsker, and Kirbi Fagan’s “Extrahumans” courtesy of Susan Jane Bigelow and Book Smugglers Publishing on the cover. Episode 12A (September 6): Editors’ Introduction, Carmen Maria Machado’s “My Body, Herself” (as read by Erika Ensign), S. Qiouyi Lu’s “肉骨茶 (Meat Bone Tea)” (as read by Amal El–Mohtar), and an interview with Una McCormack conducted by Deborah Stanish. Episode 12B (October 4): Editors’ Introduction, E. Lily Yu’s “The Witch of Orion Waste and the Boy Knight” (as read by Amal El–Mohtar), Ada Hoffmann’s “Million–Year Elegies: Tyrannosaurus” (as read by Erika Ensign), and an interview with Dominik Parsien and Navah Wolfe conducted by Deborah Stanish. 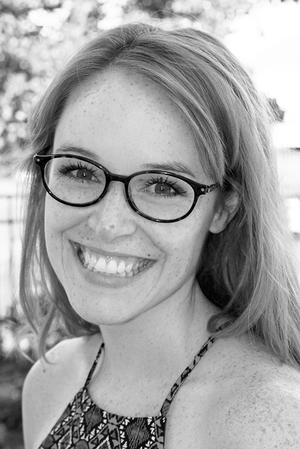 Kirbi Fagan is an award–winning Metro Detroit based illustrator who specializes in creating art for young readers. Her illustrations are known for their magic themes, nostalgic mood, bright colors, and powerful characters. She received her bachelor’s degree in Illustration from Kendall College of Art and Design. Kirbi teaches workshops for both kids and adults. She is active in the illustration community both online and at large. She has participated and curated art events with “Art Prize,” “Art.Downtown,” Grand Rapids Children’s Museum, Square Peg Studios, and more. Kirbi’s work has been acknowledged by organizations such as the Society of Illustrators of Los Angeles and New York, ImagineFX, Art Order, and the International Writers & Illustrators of the Future. Recent clients include Marvel, Capstone Publishing, and Dark Horse Comics. Kirbi lives by two words: “Spread joy.” When not painting, Kirbi enjoys writing stories, spending time with her family, and rollerblading with her dog, Sophie. The cover is “Extrahumans” from the book of the same name by Susan Jane Bigelow, courtesy of Book Smugglers Publishing.